One day you may need to redefine default output from the admin panel of Magento. For such things, in Magento 1.x and 2.0 there is a possibility to re-define default templates that allow us to make any customization of the theme. Let’s look into customizing of attributes in the admin panel of Magento 2.0. To re-define product attributes block, we need to rewrite appropriate layout rules. In our layout we should reference to the catalog_product_attribute_edit.xml. In this file we changed the block \Magento\Catalog\Block\Adminhtml\Product\Attribute\Edit\Tabs. With this referenceContainer update we replaced Magento\Catalog\Block\Adminhtml\Product\Attribute\Edit\Tabs block with our custom Belvg\CustomStockStatus\Block\Adminhtml\Product\Attribute\Edit\Tabs. And added a new block Belvg\CustomStockStatus\Block\Adminhtml\Product\Attribute\Edit\Tabs\Statuses. This block will define the look of our custom tab. Directive $this->getChildHtml(‘statuses’) references to the Belvg\CustomStockStatus\Block\Adminhtml\Product\Attribute\Edit\Tabs\Statuses block (we defined it in the catalog_product_attribute_edit.xml). Statuses block is responsible for the content of the new tab. Now we should define the template and custom logic for the new tab. The main principles of redefining and customizing the default theme are the same in Magento 2.0 and Magento 1.x. 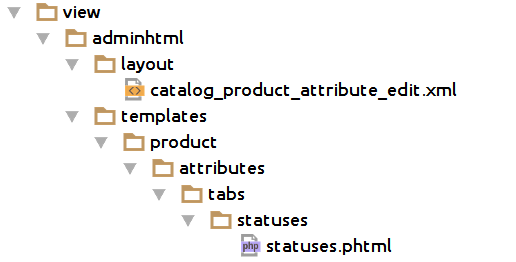 But in Magento 2.0 all template and layout files are located in the module’s catalog. I think it’s really convenient and won’t take much time for Magento 1.x developers to switch.